Cleadon is a suburban village in South Tyneside, North East England in the county of Tyne and Wear, and the historic County Durham. In 2001 the population of Cleadon was 4,795, increasing for the South Tyneside ward of Cleadon and Boldon at the 2011 Census to 8,457. 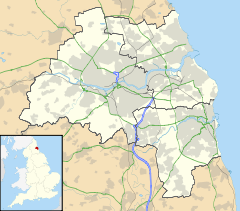 Nearby villages or population centres include East Boldon, Whitburn, and Jarrow. The village is around 5 miles from the city of Sunderland and 10 miles from the city of Newcastle. There has been a village on the site of Cleadon for over a thousand years. Cleadon has a traditional village pond which is the remnants of an ice age lake and dates to Roman times, and an early history of South Shields suggests that there may have once been a Roman watchtower or turret on Cleadon Hills. The name of the village is derived from 'Cliffa-dun' meaning a hill with a cliff, which over years became Clevendona, Clyvedon (recorded in 1280), Clevedon, and in the 17th century Cleydon. The village was first mentioned in print in the Boldon Book, a survey of the local area completed in 1183. The oldest houses in the village, one of which contains a priest hole, date to the 15th century. Located on the main north–south road of England, Cleadon was a popular rest spot for those passing back and forth from London to Scotland. During the 19th century, Charles Dickens reportedly stayed for a time in Cleadon House on Front Street. A story he was told by resident George Cooper Abbs was a possible inspiration for the character Miss Havisham in Great Expectations. Cleadon village and its environs suffered some bomb damage during the Second World War. Bombs fell in Whitburn Road, Bywell Road and on Boldon Flats, some of these incidents resulting in fatalities. A 'stick' of bombs fell on a line between Underhill Road and the Whiteleas Isolation Hospital. In another incident a bomb fell on Cleadon Farm and some livestock were killed, the Cleadon Cottage Homes also suffered some damage. The bombing of the village, on some occasions at least, could have been due to its proximity to a 'Hedgehog', a decoy designed to simulate burning buildings that was situated at Welland's Farm, at the foot of Cleadon Hills in nearby Whitburn. A container of propaganda leaflets was also found on Cleadon Hills during the war years that had been dropped from an enemy aircraft. Cleadon Hills is a ridge of high ground standing between the village and the coast. Around 260 million years ago the hills were, together with others in the area, a group of small low islands in a tropical lagoon referred to as the Zechstein Sea. The ruined windmill on the hills was constructed in the 1820s. The mill is built on the highest part of Cleadon Hills on a slight artificial mound. The building incorporates a stone reefing stage, a feature that was peculiar to windmills in the area. The mill was severely damaged in a storm at some time during the 1870s, and then suffered the indignity of being a target for gunnery practice during the First World War. A photograph dating from the 1920s shows the rotating cap and the windshaft more or less intact but without the sails, which were presumably destroyed during the storm that put the mill out of business. Nowadays the entrances to the mill are barred and locked, the remains of internal machinery that were visible in the mill during the 1970s are now gone, although broken fragments of a millstone remain. A local legend relates the story of Elizabeth Gibbon, a heartbroken woman who threw herself from the top of the mill tower and whose ghost apparently haunts the ruin of the mill to this day. The windmill was operated by the Gibbon family at the time the storm took place, which lends some weight to the tale of Elizabeth's suicide. Also on Cleadon Hills is a former water pumping station, which once provided water to the South Shields area. The site is dominated by the landmark Cleadon Water Tower, in fact a chimney for the former steam-powered pumps, which is visible for miles around, as far south as the Headland in Hartlepool. It is Grade II listed. The works were built for the Sunderland and South Shields Water Company to a design by Thomas Hawksley from 1860 to 1862. The facility was typical of the grand Victorian waterworks style of the day, and resembles its sister station at Ryhope Engines Museum which was built a few years later. It was one of a chain of wells that stretched from Cleadon in the north to Hesledon in the south, which were constructed to exploit the reserves of clean fresh water that lay trapped in the permeable limestone. Little is known about the engine that drove the pumps, it was described as a 'high class' beam engine of 130 hp, driving a pump that drew water from a well 258 feet deep and 12 feet in diameter, the water standing 18 feet deep at the bottom. The works were electrified in 1930 and the steam plant removed. The chimney itself is 100 feet tall and the balcony is 82 feet above ground level; a square spiral staircase of 141 steps winds around the central flue. It was designed to resemble the well-known Italian campanile bell towers, and was placed above the works on the highest part of the hill to facilitate boiler draughting and the dispersal of smoke and steam. While the other buildings have since been converted into homes, the chimney has been threatened with demolition at least once, notwithstanding the fact that it now houses a number of radio aerials, and presumably generates revenue in the form of rent. It was also, together with the Paper Mill chimneys at Grangetown, south of Sunderland, used as a navigation landmark by Luftflotte (Air Fleet) 5 of the Luftwaffe, operating from Stavanger in Norway and Ålborg in Denmark during the Second World War, while engaged in attacks against Belfast and Liverpool. The reservoir was later covered with a large concrete dome, then believed to the biggest of its type ever constructed, which is still in place today. Two pill boxes were constructed on the South Side on Cleadon Hills to allow placement of machine gun positions overlooking the fields leading from Whitburn to Cleadon. One of these collapsed in the 1970s and remained in a dangerous condition until removed, the other box being demolished at the same time. The undisturbed remains of several concrete machine gun nests can still be found in the undergrowth on the side of Cleadon Hills. A small painted hill figure of a white horse, 6 feet tall and 9 feet long, appears on a low cliff on the hill. Before houses were built after the Second World War it could be seen from South Shields and can still be seen from Herd Groyne lighthouse. It has often been defaced by graffiti but it was restored in 2012 and in 2013 by a team of volunteers with a repainted black background and is now a white horse on a natural limestone rock face. It has recently (Sept 2014) been restored by the council. Its origins are unclear—there are at least five different stories that explain why it was painted, possibly as early as the 1840s. One story is shown on information boards nearby and tells a story of a man who rode the white horse off Marsden cliffs. The village expanded quickly in the post-war period and was a popular suburb for middle-class people working in South Shields and Sunderland. Newer houses were built in the 1950s and 1960s among those that were built before the Second World War. The demolition of some cottages and other houses in the village in the 1970s gave rise to some controversy. Cleadon Meadows, now a private housing development, was once the site of a large house owned by John Broderick Dale, a banker. Cleadon Old Hall, now a block of modern apartments, was once the site of a house of the same name that was demolished in the late 1940s to assist in easing the double bend in the road through the village. Another development, sometimes referred to as the 'Lakes' estate, was formerly occupied by gardens and a large number of hothouses. This was Groves Nursery. One of the two village ponds, situated on the corner of North Street and Sunniside Lane was filled in during the 1970s, its location now identifiable by a fenced area of grass. Famous people who have lived within Cleadon include footballers such as the former Sunderland A.F.C. player Michael Gray. Carlo Little, original drummer of the Rolling Stones and member of Screaming Lord Sutch and the Savages, lived in Cleadon for many years. Actor Bill Travers also resided in the village at 17, Underhill Road, sometime after WW2. Don Revie, former Sunderland AFC player, Leeds United and England manager, lived in Cleadon as did former Sunderland AFC Manager Alan Brown who lived in Whitburn Road. Ernie Taylor, famed for being part of Blackpool's 1953 FA Cup win against Bolton Wanderers, also lived in Whitburn Road. David Holt and the world-famous Jasper the Jackapoo currently reside in Woodlands Road. Before 1945, James Humble of the Humble family owned Cleadon Hall in County Durham; it was called "Humble" Hall. The Humble family owned coal mines and farms in County Durham. There are two pubs in Cleadon Village, the Britannia Inn and the Cottage Tavern. Another pond, situated on the corner of North Street and Sunniside Lane was filled in during the 1970s, its location now identifiable by a fenced area of grass. The park in central Cleadon was formerly the grounds of Cleadon House (see above) which incorporates Bluebell Woods and the lake at one time incorporating row boats, but now filled in after several drownings. The well known boathouse in Bluebell Wood has long since fallen into disrepair. This building is often perceived to be a dungeon or prison owing to its metal bars and menacing appearance. The bars were fitted in the 1980s in an attempt to prevent further vandalism. It has recently been speculated that the building may have been originally an ice store serving Cleadon House, the structure later being converted to a boathouse. Bluebell Wood also attracts numbers of BMX and Mountain bikers using the rough ground and mud ramps. There are a few shops including Bon Appetit Deli, Boutique Bijoux, Happy Organic, Romanos Italian restaurant, chemist, papershop, garage and a Post Office (now closed). The Post Office has relocated, to within the village travel agency, Village Travel. Cleadon is close to the East Boldon Metro station. Cleadon is part of the Jarrow constituency, represented by Labour MP Stephen Hepburn. It is in the council ward of Cleadon and East Boldon. This ward is represented by Joan Atkinson and Margaret Melling of the Labour Party and Conservative councillor Jeff Milburn. Margaret Melling won a by-election in 2013 after the death of David Potts. ^ "South Tyneside Ward population 2011". Retrieved 30 January 2016. ^ Hows, Mark. "Cleadon Hills White Horse". The Hillfigure Homepage. Retrieved 16 October 2011. ^ "Other non-Wiltshire white horses". Wiltshire White Horses. Retrieved 16 October 2011.